Amaze and Excite Your Students! 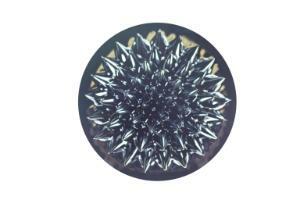 Amaze and excite your students with ferrofluid, an incredible substance which is in liquid form until a strong magnetic field is brought near it. As the magnet comes closer to the ferrofluid, spikes begin to rise from it. Ask students to determine the reason for this peculiar reaction. 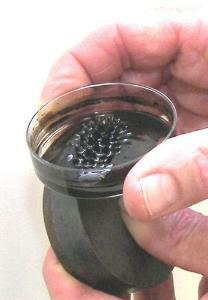 Ferrofluid, a colloid with magnetic nanoparticles suspended in an oil base, was originally discovered by NASA scientists. Now ferrofluids are used to make rotating seals in high vacuum equipment and can be even found in high end speakers. Ordering information: Materials include Vinyl Gloves, Jar with Lid, Instructions, Petri Dish, Ferrofluid, Glass Vials with Caps, Ceramic Block Magnet, Cylindrical Magnet, Nylon String, Plastic Jar with Lid, Modeling Clay, Test Tubes with Stoppers, and Bar Magnet. Pennies, Scotchgard™ spray, Water, Paper towels, Liquid dish soap, Lab coat/apron, Safety glasses are materials needed but not included.